Le-Vanguard: Cray Journal: Granblue, the strongest budget deck!! Cray Journal: Granblue, the strongest budget deck!! 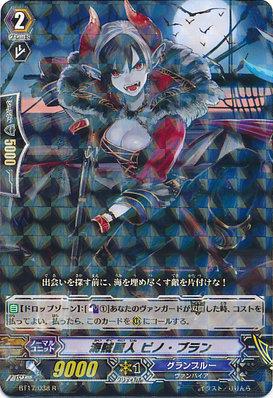 [ACT](VC): Legion 20000 "Pirate Belle, Pinot Blanc"
[AUTO](VC): [Put 3 cards from the top of your deck into the drop zone] When this unit performs Legion, you may pay the cost. If you do, choose one card from your drop zone, and call it to (RC). [AUTO](VC): [Choose 1 of your rear-guards, and retire it] When this unit attacks a Vanguard, you may pay the cost. If you do, this unit gets [Power]+5000 until end of that battle. 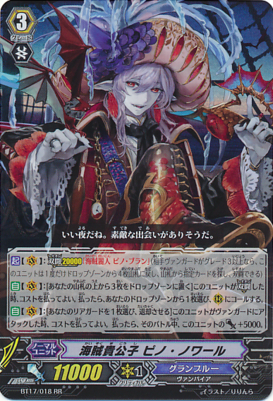 [ACT](VC): Legion 20000 "Dragon Undead, Ghoul Dragon"
[AUTO]((VC): [Counter Blast (1), Choose one of your rear-guards, and retire it] When this unit attacks a Vanguard, if this unit is in Legion, you may pay the cost. If you do, choose 1 card from your drop zone, and call it to (RC). [AUTO](VC): When this unit attacks a Vanguard, if there is another unit in the center column, this unit gets [Power]+3000 until end of battle. 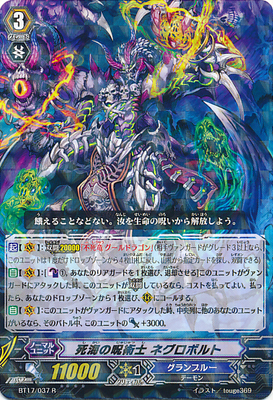 [AUTO] When this unit is placed on (RC) from your drop zone, until end of turn, this unit gets "[AUTO](RC): When this unit's attack hits a Vanguard, choose 1 of your opponent's rear-guards, and retire it" until end of turn. WOOOOOWWWWW... I see so many ways to abuse these 2 together. A simple way would be to attack with a rear-guard column first, then superior call Ghoul Dragon in the front row of that column. With this, you get an extra 1 attack for that turn. Even better, Ghoul Dragon would add pressure to your opponent to guard. I must say, this is really impressive, considering it's only an R.
Corrosion Dragon is almost like a staple in this deck... You can either call it via Pinot Noir, or Negrobolt's skill for a nice 12k whacker. The reason i put deadly nightmare instead of samurai spirit, is because this deck is quite counterblast heavy. The soul isn't used for anything other than the banshee, so might as well use it to spawn perfect number 16k columns right? Sea Strolling Banshee... Lets you soul blast 1 to draw when she's called from the drop zone. With the 2 bosses listed above, need i say more? Chief of the Deck, Arman... He gains +3k when you superior call him from the drop zone. Basically a G1 version of Corrosion Dragon, i only run 2 of this simply due to the lack of G1 space. Evil Shade boosts your Vanguard for 10k by milling 2 at once. Sets up for Legion and puts revivables in the drop zone for you? OH HELL YES. The universal negate can be any negate post-bt16 since it doesn't have a clan restriction. If you want, you could run Gust Jinn, but this is meant to be a budget deck. 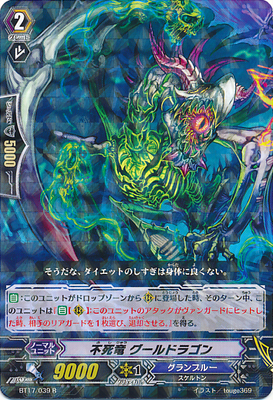 Gust Jinn is from bt02, an extinct set, and you're gonna blow a hole in your wallet trying to get 2 of him. Cheap and good, welcome the era of the Granblue Pirates! !